John McAfee has pushed this stock up 700%! John McAfee is many things. A pioneer in the business of computer security. A Libertarian presidential candidate. A suspected murderer. But now McAfee is once again, amazingly enough, the CEO of a publicly traded company. MGT (MGT), a penny stock that has several online and mobile gaming units, announced earlier this month that it was acquiring some of the assets of D-Vasive, a cybersecurity firm backed by McAfee. It's what's known as a reverse merger, when a private company acquires the shell of an already publicly traded company. 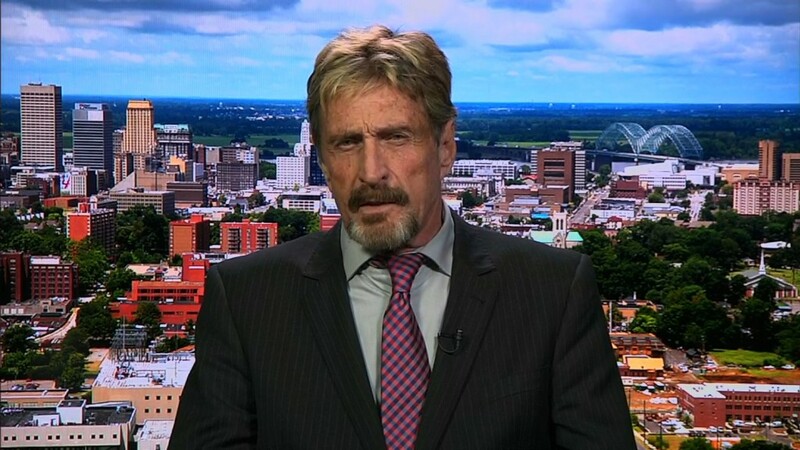 MGT plans to rename itself John McAfee Global Technologies, Inc.
"The enormous impact of cybersecurity on our lives requires the scale and resources of a public company. Our ability to continue to hire the best minds in the business will be vastly enhanced with a public platform," McAfee said in a statement. MGT also announced a partnership with Future Tense Secure Systems, a tech incubator specializing in online privacy that is also run by McAfee. It's been a long road back to Wall Street for the 70-year old McAfee, who left his eponymous firm in 1994. It was sold to Intel (INTC) in 2010 for about $7.6 billion. In 2012, McAfee, who had subsequently moved to Belize, became part of a bizarre story that a Hollywood studio exec would probably reject for being too preposterous. McAfee's neighbor was found shot to death and McAfee was sought for questioning. He eventually went on the lam, was jailed in Guatemala and faked a heart attack there while in police custody. McAfee has never been charged with a crime in Belize though. Guatemala then deported to him to the United States -- where the heavily tattooed McAfee has reinvented himself as a Libertarian presidential candidate. Traders are having fun with MGT, batting the stock back and forth like a cat with a ball of yarn. 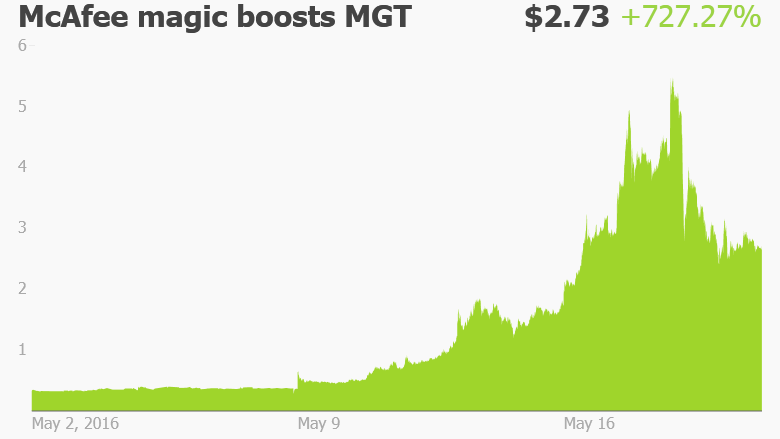 Shares of MGT, which were trading at just 36 cents before McAfee took it over, surged as high as $5.58 earlier this week, but have since pulled back to about $2.70. Even with this pullback, the stock is up more than 700% since McAfee became involved with it. So why is there such intense interest in a company that has a market value of less than $50 million? Chalk it up to some great self-promotion by McAfee. Cybersecurity Pioneer John McAfee Renews his Commitment to the Technology Space that he Practically Created 30 Years ago with the McAfee Anti-Virus Software. MGT was not immediately available for comment. But McAfee has been extremely active on Twitter, and is trying to reassure investors who are nervous about the stock's insane level of volatility. He tweeted on Tuesday that "I'm in this company for the long haul. Announcements coming in a couple of weeks." He also retweeted a comment from someone who declared that he's "more powerful than Bill Gates and Steve Jobs!" It is going to be entertaining to see what's next from McAfee -- especially as he continues his long-shot quest to replace Barack Obama in the White House. But long-term investors should not get duped into thinking that MGT is suddenly going to become the next Intel, Symantec (SYMC), Palo Alto Networks (PANW), FireEye (FEYE) ... or even the next McAfee. CNNMoney's Jose Pagliery contributed to this story.